Woodland - Where Did You Get That Light? Classic drum: This is a classic shape which looks good as a ceiling light and suits most bases. Tall drum: This shape is a little longer than the classic Straight Drum and as such gives a more contemporary and unusual look. It suits a taller base and also works well as a pendant shade. French drum: Another classic design which lends itself to most lampbases. We have experimented with a number of similar shapes and think that the slope of its sides is just about right. 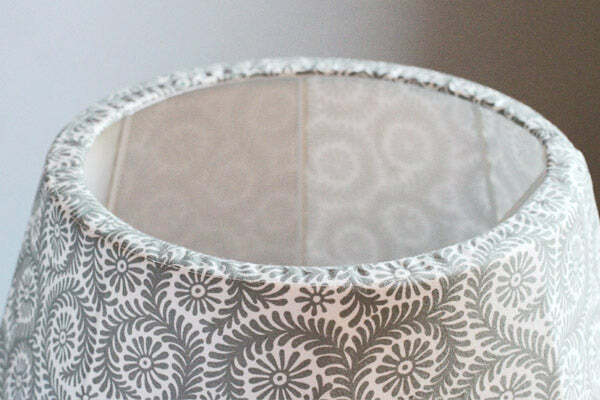 We can make your fabric shade in two different ways. We can use our flame retardant backing material, giving a crisper, more modern look. The fabric is backed onto a stiff card which creates the structure of the shade. We can stitch the fabric onto a metal frame. This is how fabric lampshades used to be made and the effect is softer and slightly more traditional.